A couple of years ago I joined the board of directors for a local sports group. At the time my daughter was involved in figure skating, an activity she has pursued since we arrived in Fort McMurray over a decade ago. She went from preschool skating to Canskate and eventually to actual figure skating, and since we spent a lot of time with this group I decided to throw my hat in the ring for the board, and was elected. I spent a year on that board with the people from the Noralta Skating Club, and during that time one of the ideas we began to explore was the concept of a corporate challenge. I left the board after a year, when my daughter decided to stop skating, but this past weekend I was delighted when the idea that I had seen come from nothing but chatter became reality - the Wood Buffalo Corporate Challenge. 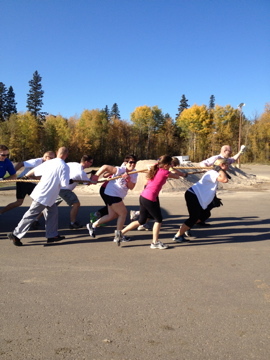 The idea of the Corporate Challenge is to facilitate team building through sport and activity and social interaction in a fun and mildly competitive setting. 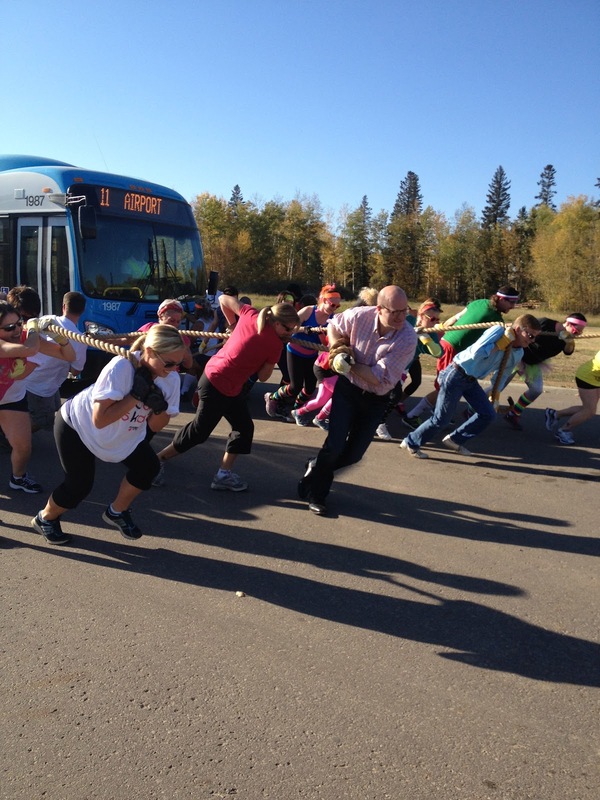 Teams from different sectors of industry and business participated, as well as some teams from non-profit organizations - and that's where I came in. I saw that some of my favourite people in the community, the good folks with Volunteer Wood Buffalo, were looking for team members. Having some free time I volunteered my services (as long as I could write about it, of course), and I was delighted to be accepted. 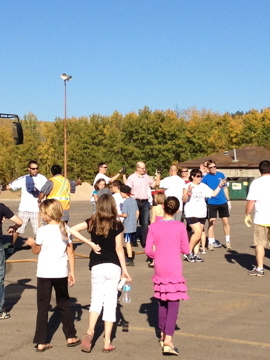 In short order our team joined with the team from REMAX, and thus our realtor/non-profit team was born. I eagerly awaited the schedule to arrive in my email inbox, the schedule that would tell me what I was going to be doing at the WBCC. And when it arrived what I was scheduled for was dodgeball. 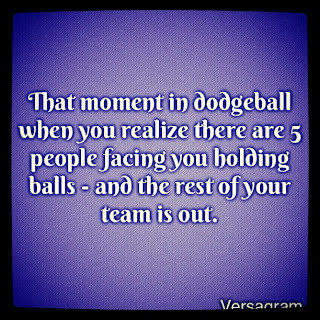 Dodgeball? I haven't played dodgeball since Grade 4, and so Thursday night I sat the Intrepid Junior Blogger down and had her go over the rules with me again. I got the basics but then she veered into some dodgeball variants that I didn't even know existed, and I got rather lost. Finally, though, she looked me in the eye and said "You know those balls hurt you when they hit you, right? You know this is gonna hurt, right? 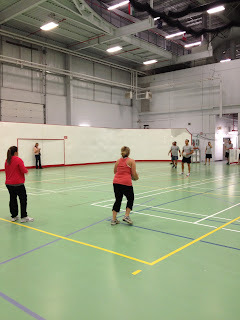 ", and I saw my doom in those beautiful brown eyes because she knows dodgeball much better than I.
Undaunted I showed up Thursday afternoon at MacDonald Island Park, wearing a hot pink Lululemon jacket and runners (never thinking that the hot pink jacket pretty much screamed "target"). I had never met the other members of my team before, but I was pleased to find a friendly and fun group. We quickly went over the rules of dodgeball and then I watched some of the other teams warm up - which was a mistake. With growing horror I realized that some planned to take this very, very seriously. After watching one competitor whipping dodgeballs at the wall at top speed I realized that if he hit me I'd likely not only end up bruised but with whiplash. It was with some trepidation I took the court with my team, lying flat on my stomach until the whistle blew and we raced to get to the balls first (I don't remember THAT part of dodgeball at all). And really people it was all fun and games, and while we lost most games we put up a valiant effort. I slowly realized that while I am an excellent dodger I am also a pathetic thrower. We played several teams, and most whipped us quite soundly, although we won one or two. The most memorable moment for me, though, was when we were playing quite a competitive team but I thought we were doing quite well. I found myself holding two balls and I went to hand one to a team mate, so I looked left - and no one was there. I looked right, and no one was there. I looked behind me and there they all were, all tagged out, and I was alone on the court - facing five very large men all holding dodgeballs. And that is the moment of course when I thought "well, I'm screwed now". I dodged the first 4 balls - but in the end I was tagged out and it was all over. As for the pain - well, that didn't come until the very last game, when I had been already tagged out and was waiting to see if I would get back in the game. A fast ball aimed directly at a team mate missed them and hit me squarely on the shin, eliciting a howl of pain and indignation. The kind man on the throwing end of that ball apologized profusely, although it wasn't really necessary, but it was nice. It was dodgeball, and I had been warned it was going to hurt (and it hurt like a damn, too). Dodgeball finished I said farewell to my lovely team mates and discovered via Twitter that the bus pull event was about to begin - and I knew I had to be there. 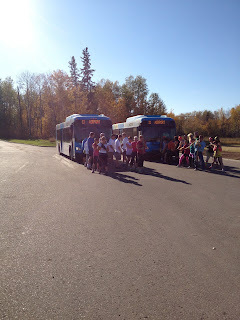 I dashed out the door and over to the parking lot where I found the team from MacDonald Island Park, the team from Noralta Skating Club, two city transit buses, and two local MLAs who had been somehow talked into captaining the bus pull. What amused me most was that the destination on both buses read "airport", and I quipped that I hoped no urgent government business awaited as apparently Don Scott and Mike Allen would be pulling these buses all the way to the airport. Don was acting as captain for the Noralta team, and Mike for the MacDonald Island team (who incidentally won the crazy costume portion of the bus pull in my mind). 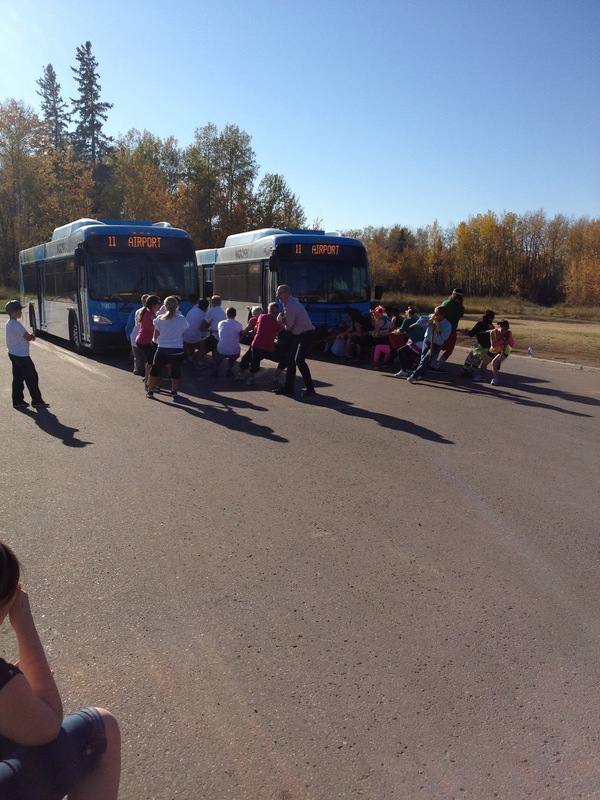 There was great anticipation in the air as they all donned gloves and grabbed the ropes attached to the buses and awaited the word to go. And when the word came they went - pulling and straining - and the buses didn't move an inch. I quipped again that perhaps they should take the brakes off, but no one was more surprised than I when they halted the pulling to do exactly that, a false start that caused great giggling in the crowd. 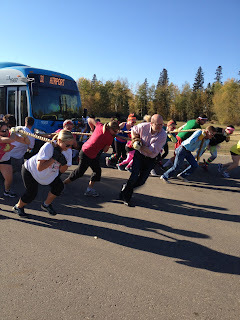 Brakes off, the word to go was given and the pull began in earnest, Mike and his team quickly pulling ahead but then suddenly Don's team in the lead and pulling their bus across the finish line first. As Mike later said one of his team members "got thrown under the bus" - not literally but rather one person had fallen and so the driver had put on the brakes to prevent the bus rolling over them. Regardless of who won and who lost it was a moment of great amusement for all in attendance (particularly me, who finds the things expected of our local politicians deeply entertaining and a cautionary tale against ever considering running for public office). I went and said my congratulations to Don and my condolences to Mike, and then I hopped into my car. My shin was still stinging from being nailed with a dodgeball. I was still laughing about the false start at the bus pull, and I was smiling from ear to ear. 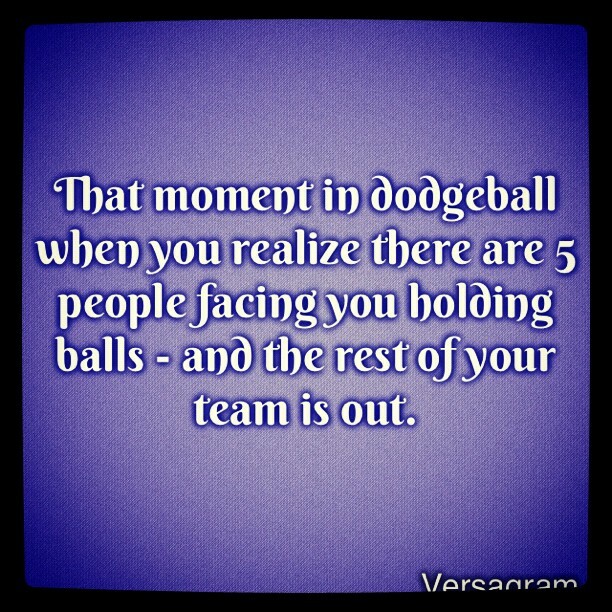 I was smiling because of my dodgeball team mates, and my moment when I remembered why I hate dodgeball. 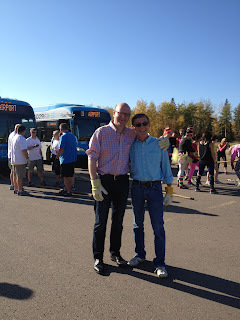 I was smiling because I had seen two MLAs pull a bus in a parking lot, cheered on by local kids. I was smiling because I had seen just a small bit of an event that had once only been an idea become reality. I was smiling because that is the kind of community this is, the kind where you have an idea and you share it and it is embraced and you run with it and it becomes real. And I was even smiling about the growing bruise on my shin, because I would be able to go home and show it to the Intrepid Junior Blogger and say "you were right, dodgeball hurts - and it was bloody good fun, too". for letting me be a small part of their team!